This week’s meal plan features another 80 Day Obsession Refeed Day! After a week of vacation I’m looking forward to getting back on track with my eating. The purpose of Refeed day is to replenish glycogen stores in your muscles so you can work out harder and get better results. On Refeed day you choose carbs from the supplemental yellow list. Instead of whole grain carbs you are allowed white rice, pretzels, and white pasta. There are also a number of desserts on the list from the Fixate Cookbook available through Beachbody on Demand. This week I’m giving the Banana Oatmeal cookies a try. 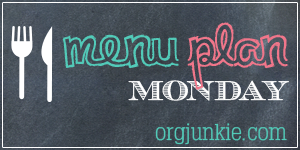 It is hard to cook a new item every day–without repeating the same menu in a week! Love this help. I’ve downloaded the meal plan template too. I’m glad you find this helpful Seren. I do like to mix things up so meals don’t get boring.